Wesson D, Stephens D, Lam K, Parsons D, Spence L & Parkin P. Pediatrics. 2008;122:605-610. This paper is a study of cyclist deaths in Ontario during a 12 year period in which helmet legislation came into force only for children. Child cyclist deaths declined faster than adult cyclist deaths in the period. The authors conclude a link of reduced deaths from the legislation. RESULTS. There were 362 bicycle-related deaths in the 12-year period (1–15 years: 107 deaths; _16 years: 255 deaths). For bicyclists 1 to 15 years of age, the average number of deaths per year decreased 52%, the mortality rate per 100 000 person- years decreased 55%, and the time series analysis demonstrated a significant reduction in deaths after legislation. The estimated change in the number of deaths per month was -0.59 deaths per month. For bicyclists >16 years of age, there were only slight changes in the average number of deaths per year and the mortality rate per 100 000 person-years, and the time series analysis demonstrated no significant change in deaths after legislation. CONCLUSIONS. The bicycle-related mortality rate in children 1 to 15 years of age has decreased significantly, which may be attributable in part to helmet legislation. A similar reduction for bicyclists 16 years of age through adulthood was not identified. These findings support promotion of helmet use, enforcement of the existing law, and extension of the law to adult bicyclists. These conclusions are straightforwardly wrong. During the period of study (1991 – 2002), helmet use by Ontario children increased after the 1995 law came into effect, but then fell back to pre-law levels by 1999 (Macpherson et al, 2006). This is because the law was not enforced (Macpherson, 2005). There was thus no net change in helmet use in the period of study. The reduction in child cyclist deaths observed cannot have been related to increased helmet use. The authors report helmet use by children selectively. In this way, they create the impression that helmet use was sustained post-law, when it was not. The critical sentence in their paper reads: "In the same urban community.... helmet use exceeded 65% in the 2 years after the introduction of legislation and reached 85% in high income areas 6 years after the introduction of legislation". This is an extract from full results that have been reported (Macpherson et al, 2006). It seems extraordinary that the authors could extract a sub-trend from a chart (i.e. the small minority of children in high income areas) without reporting the primary trend. During these two periods, helmet use by child cyclists was the same, as noted already. The very small number of child cyclist deaths by 2002-2004 (about 3 per year) means that the apparent advantage for cyclists is compatible with the effects of chance. Similarly, adult cyclist deaths have large year to year fluctuations, due to the low numbers (there were 178 adult cyclist deaths during 1993 to 2004 inclusive, and 1,342 adult pedestrian deaths). 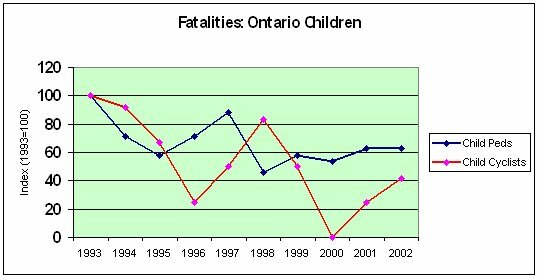 The presentation of the actual child fatality data (indexed to 1993 for ease of comparison) reinforces the conclusion that there was no relation of helmet wearing to fatalities. It is ironic that child cyclist deaths actually spiked in the years 1996-1998, the period of highest helmet use after legislation, whereas deaths dropped sharply 1998-2000 as helmet use declined to pre-law levels. It is not proposed that there is a causal link; the number of child cyclist deaths is extremely low and prone to large fluctuations. But it is clear enough there is no pattern linking reduced deaths to higher rates of helmet use during 1996-1998. In conclusion, the large fall in deaths of child cyclists must actually be due to non-helmet factors, such as reduced exposure, better vehicle design and street management programmes to reduce vehicle speeds. These also benefited child pedestrians. The authors make reference to early case-control studies, such as those in the Cochrane Review of bicycle helmet effectiveness. They ignore the effects of mass helmet use in the real world. The Cochrane Review reports large reductions in serious head injuries from helmet use, yet real world outcomes show no noticeable change in serious head injuries with mass helmet use. In recent years, the poor reliability of case-control studies, and systematic reviews based on them, has caused disillusion in the epidemiology community (Lawlor, Smith and Ebrahim, 2004; Smith, 2004). The outcomes of helmet laws in New Zealand and the states of Australia were reviewed (Robinson, 2006), and no noticeable reduction in serious head injuries could be observed, after natural trends and declines in cycling were accounted for. These results apparently show that protective effect increases sharply with severity of injury. This is implausible and in any case is refuted - as noted previously - by experience. However, this is the pattern that would be expected if lower socio-economic class correlates - as it does - with more severe accidents and not wearing a helmet. A large "helmet effect" would be observed even with helmets of tissue paper. The above dataset forms the heart of the Cochrane Review of Bicycle Helmet Effectiveness (Thompson, Rivara and Thompson, 2002-9). The review was carried out by the authors of the original research. They have never commented on this aspect of their data. The authors state: "Children are at risk for bicycle-related fatal injuries". No data are presented to assess the risk relative to other daily activities. Cycle helmet programmes and legislation have never been justified by evidence that cycling is particularly hazardous or a major cause of head injury. All such programmes rest for their credibility upon a deep- seated stereotype that cycling is "dangerous". In fact, risk assessments show that cyclists face everyday risks comparable to pedestrians and drivers (Wardlaw, 2002; Krag, 2005). In Canada, the rate of child head injury admission due to cycling accidents is exceedingly low. National data (from CIHI) show the annual rate was 11.5 admissions per 100,000 children per year in 1997/98, or 1 case in 8,700 annually. This level of risk does not justify helmet legislation, or promotion of helmets, at least not for utility cycling. Further analysis shows that the principal factor affecting risk is the popularity of cycling (Wardlaw, 2002; Jacobsen, 2003); where cycle use increases, the risk per cyclist decreases. Enforced helmet legislation has repeatedly been linked to large declines in cycling and consequent increases in risk per cyclist. There are many examples of this, but to cite only one, an all-ages helmet law introduced in Nova Scotia in 1997 was followed by a substantial drop in the number of cyclists counted (LeBlanc, Beattie and Culligan, 2002). Note: the authors of this paper have denied that their count data can be used to infer a drop in cycling. However, in their paper they state: "In 1995/96, 1494 cyclists were observed on 17 days. In 1997, 636 cyclists were observed on 19 days. In 1998/99, 672 cyclists were observed on 13 days". Assuming their counting methodology was even vaguely systematic in terms of site, weather and time of day, their figures in fact strongly support a major drop in cycling having occurred with the enforcement of the law. Histories of the effects of enforced helmets laws are available (BHRF, 1096). The authors have analyzed a reduction in child casualties after the passage of a bicycle helmet law. They have failed to correlate this with control group information (the closely-corresponding reduction in casualties to child pedestrians), and they have failed to use relevant figures showing that the law had no long-term effect on the use of bicycle helmets (instead selecting only the figures for a small and untypical minority). Their work is not merely valueless, it claims the exact opposite of what the figures actually show. Edwards P, Green J, Lachowycz K, Grundy C, Roberts I, 2008. Serious injuries in children: variation by area deprivation and settlement type. Archives of Disease in Childhood 2008;93:485-489. Krag T, . Cycling, safety and health. European Cyclists Federation. LeBlanc JC, Beattie TL, Culligan C, 2002. Effect of legislation on the use of bicycle helmets. Canadian Medical Association Journal CMAJ 2002;166(5): p592-5. Macpherson AK, Macarthur C, To TM, Chipman ML, Wright JG, Parkin PC, 2006. Economic disparity in bicycle helmet use by children six years after the introduction of legislation. Injury Prevention 2006;12:231-235. Macpherson A, School of Kineseology, Toronto. Communication with author, reporting City of Toronto Police Services advice that no child cyclist was ticketed for violation of the helmet law. Dec 2005. .
Ontario Road Safety Annual Reports, various years. .
Smith GD, 2004. Classics in epidemiology: should they get it right?. Int Journal Epidemiology 2004;33:441-442. Wesson D, Stephens D, Lam K, Parsons D, Spence L, Parkin P, 2008. Trends in pediatric and adult bicycling deaths before and after passage of a bicycle helmet law. Pediatrics 2008;122:605-610.